In my book, August means the imminent arrival of good things! Namely, Fall, Aggie football, a relief from the heat, and excuses to wear boots. It also means hunting season is upon us, just in time to restock the freezer with more venison. 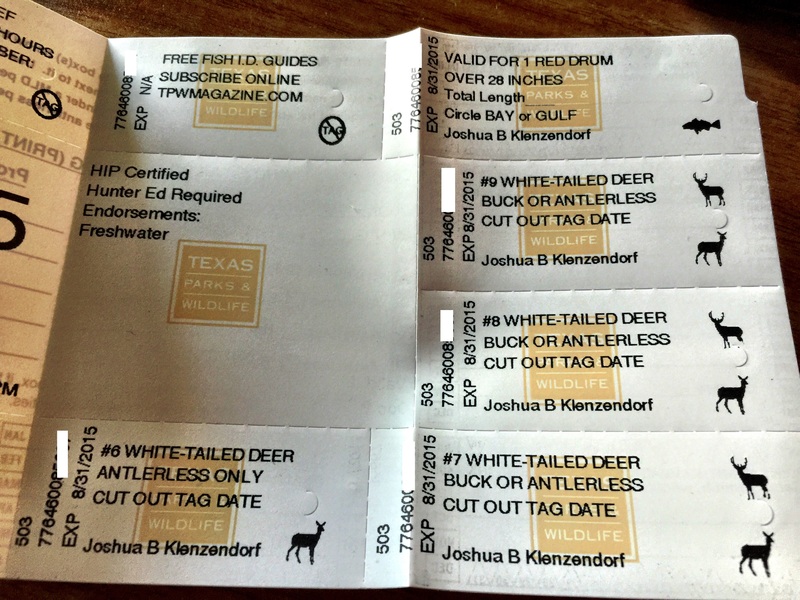 Every August, hunting and fishing licenses go on sale and if you want to hunt or fish in Texas, you will need to get one. If you’ve never purchased a license before, I know it may seem daunting, as there are dozens of different types of licenses, but don’t be intimidated–getting a license is as easy as going to the grocery store. I will explain A) What I Get and B) What you will most likely need. Hunting coyotes, feral hogs (these are not native to Texas and are damaging to our native plant and wildlife populations), and furbearing animals. But Whitney, don’t most animals have fur? What they mean here is animals like rodents. Deer to not fall under this category. Fishing in state parks. (Woo hoo!) Once you’ve paid the park entrance fees, no one needs a fishing license or stamp, whether freshwater or saltwater, adult or child, as long as they’re inside the state park. However, bag limits, length limits, and other regulations will still apply, and be enforced. 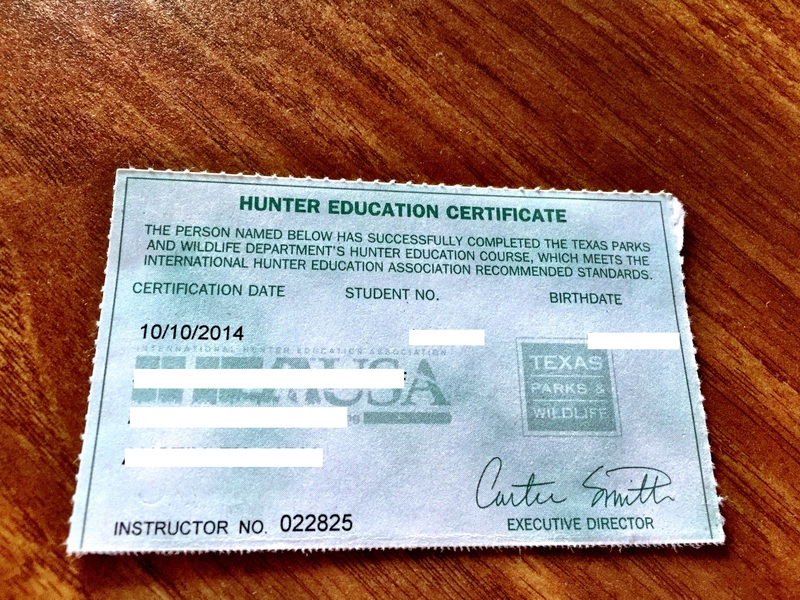 If you plan to hunt, there is one more requirement: all hunters must take a Hunter Education Class. I did this in one day at the San Antonio Gun Club. Brandon did it in a few hours online the week before his first hunting trip. You can read the details and sign up here: Hunter Education. If you don’t have time, you can defer this for up to a year for $10. or, Find a Retailer Near You! Look for the desk towards the front of the store where there is usually a sign saying “Hunting Licenses” or ask a salesperson. You will not purchase the license off a shelf. Rather, you will walk up to a person at the desk and provide identification, (drivers license sufficient), and tell him or her what you would like to buy. He might ask you whether you hunted last year and if so, how many of certain animals you took. There is no shame in saying “No” and “Zero!” He will then take down your information and print your license right then and there. Et voila! 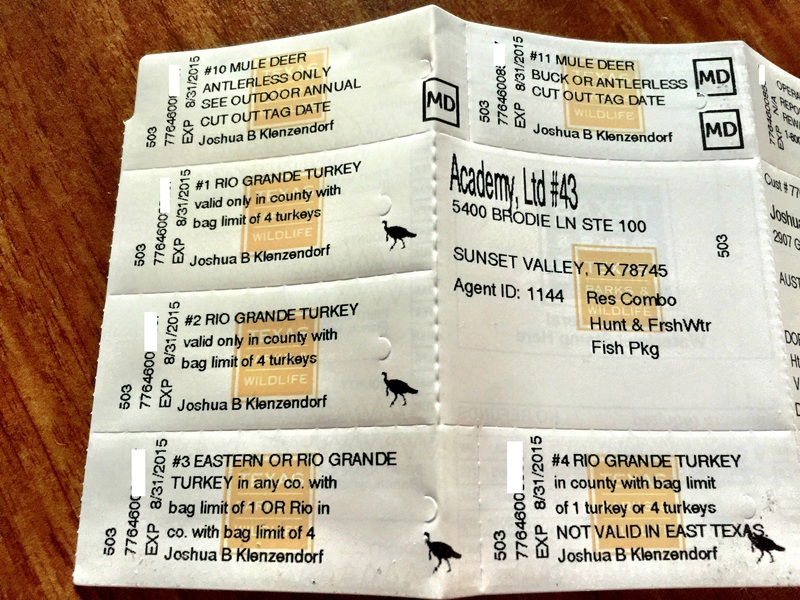 In short, there are base-level licenses that cover most hunting and fishing, and you add packages, called “stamps” on to them if you are hunting special categories of animals such as ducks or fishing in certain types of places (more below.) It’s kind of like ordering a latte, and then adding a pump of hazelnut and a pump of vanilla! There are two basic categories of licenses: non-resident and resident. I am a proud Texas resident, thanks and gig ’em. A combination license (also called “Combo”) consists of both a hunting and fishing license, and gives you a discount on both. 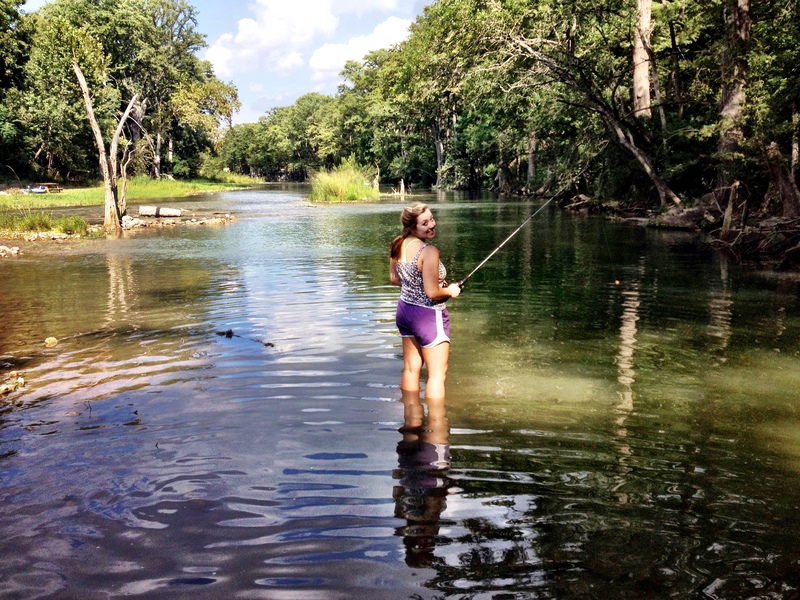 All Water Fishing means that I can fish in both saltwater (the Gulf) and freshwater (Texas rivers). 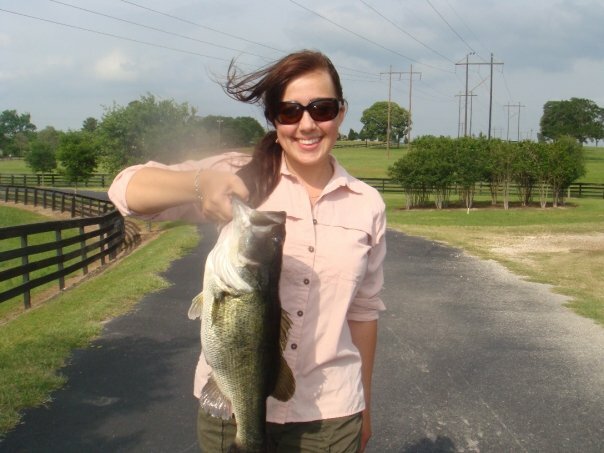 So, if I ever go fishing on Lady Bird Lake or in the Guadalupe, I am set. And, if I ever fish on the coast, I am set. This particular license allows me to hunt a number of things, most importantly, dove, quail, and Whitetail deer. And, it allows me to fish in both freshwater and saltwater. It covers all of my needs! Ask yourself, do I plan on hunting and/or fishing this year? Where and what will I be hunting? I rarely know the full answer to this question , which is another reason I go for this license. Am I going to hunt this year? If Yes, ask yourself, What am I going to hunt? If the answer is deer only, buy the simple Resident Hunting License. If the answer is dove or ducks, buy the simple Resident Hunting License and add the Texas Migratory Bird Stamp. If the answer is turkey or quail, add the Upland Game Bird Stamp. The “stamp” is only called a stamp, it’s not actally a “stamp.” I’m sure once upon a time it was an actual stamp, but now everything’s printed on the computer. Also ask yourself, Am I going to fish this year? If the answer is yes, ask yourself, Where am I going to fish? If the answer is “a river”, get a fishing license plus the freshwater endorsement stamp. If the answer is “the coast”, get the salt water stamp. Keep the license with you when hunting/fishing. Just like you would have your driver’s license when driving. Now All You Need is…. A good wild game recipe! Check out the Chickwagon Cooking section of this blog. If you have any questions, leave them in the comments and I will do my best to answer them. 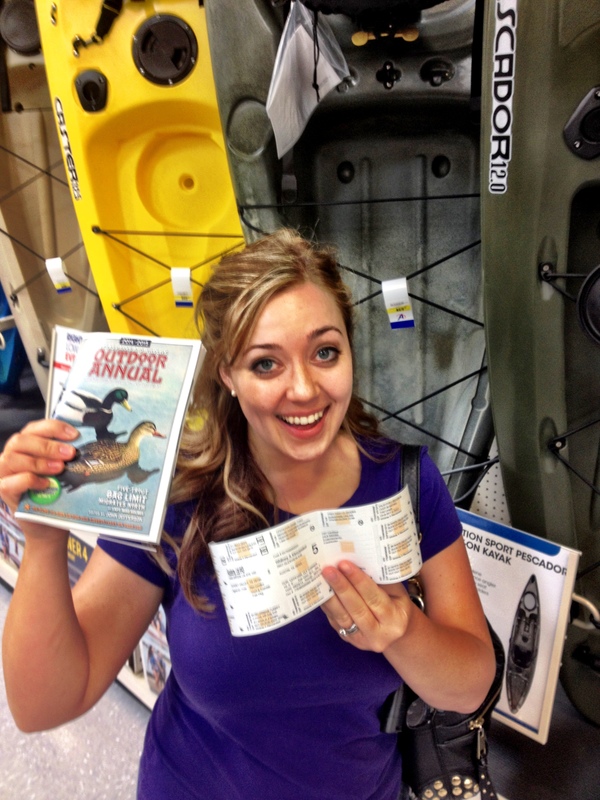 1 Reply to "How to Buy a Hunting or Fishing License"